Her community involvement includes more than half a decade with Aloha United Way and Women in the World (New Hope), and three years with MDA Lock Up, and two years with Marriage Builders (New Hope). Greater Good Radio brings Kate Hogle, who has been an account executive for more than 17 years prior to entering business, as she talks about hiring people of high potential and investing in their growth and development as an employee. Kate says that even though she has stumbled and fallen, having good individuals around her has helped in steering her back to the right path. In this interview, Kate reveals how developing and maintaining good rapport with employees, and customers and clients make all the difference in protracting growth and achieving objectives. Listen now and find out more — with a special rendition of Kate’s musical prowess — only here on Greater Good Radio. Kate Hogle sits as president and media director of KWME. Kate has more than 17 years of account management experience. 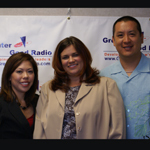 She is a member of the Hawaii Broadcasting Association, Hawaii Advertising Federation, and other targeted organizations. Kate’s community involvement includes seven years of media placement for Aloha United Way, and seven years of Leading Women In The Word, Bible Studies at New Hope. ·	She has 17 years of account management experience including media buying and media sales experience. ·	Kate was raised in Hawaii, graduating from high school at Maryknoll in 1987. ·	She is involved with the Hawaii Broadcasting Association, Hawaii Advertising Federation, and other targeted organizations. ·	Kate grew up in a family involved in the media. Her mother was in radio sales. Thanks, we’ll talk more about that after the break. ·	She worked in California out of college at Aetna Health plans Admin Assistant moved into marketing. ·	Kate considers women who have succeeded in making a difference at work, home and in the community, as her greatest inspiration.